I shouted into the granite, snow, and sky, “Ian!?!”. No response. In terrain where Ian normally smoked my wobbly self, I had pulled ahead and out of sight. 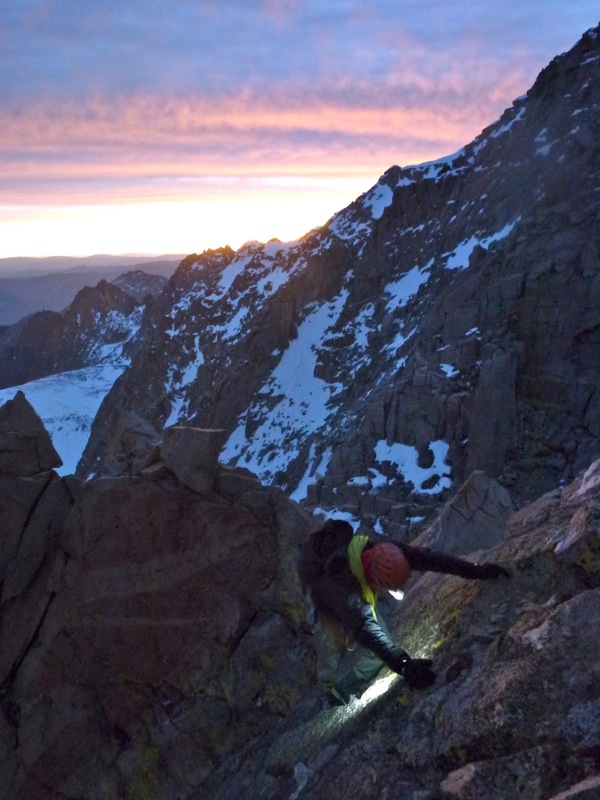 We were simul-soloing, near the beginning of our long-awaited 2013 winter attempt at the Complete Palisade Traverse. I yelled again, “Where you at?” Still no response. A third shout and my buddy’s normally booming voice responded weakly “I’m pooping... again”. Ian in "the cave". Day 2, Mt. Williams. Ian and I have post-holed, scratched around, and bailed from all over the wintry High Sierra. We climb like guides, ski like climbers, and plan like the obsessed. Over the previous year we shared a step-by-step roller-coaster of climbing’s strongest emotions. A 2012 failed attempt at the first winter Evolution Traverse and subsequent “scoopage” at the hands of the talented and motivated Pullharder collective left Ian and me briefly, but deeply, disappointment. Serious climbers in the Sierra over the last decade can be lumped into two categories: those that post on Pullharder.org and those that, usually secretly, want to be like those that post on Pullharder. Ben Horne, Konstantin Stoletov, and Shay Har-Noy started their eventually successful attempt at the winter Evolution Traverse on the same day as Ian and I, but had more time to wait out poor weather. We exited the Evolution region on day two, with Pullharder entrance tracks a taunting indicator of their likely intention. The Complete Palisade Traverse, according to Peter Croft’s legendary guidebook The Good, the Great, and the Awesome, is an enchainment that “...[encompasses] six 14000-foot peaks, even more 13,000-footers and offers several miles of technical rock climbing.” The late Sierra guide John Fisher accompanied Jerry Adams along the full length of the ridgeline in the summer of 1979. Incidentally, the year Ian and I were both born. In the ensuing years, according to exhaustive research documented by Horne on pullharder.org, the short list of successful ascent parties collects a ragtag group of Eastside locals, visiting hard-dudes, and high-end soloists. We shouldered a light five-day kit of fuel, shelter, and climbing gear and heavy burdens of history, uncertainty, and challenge at Glacier Lodge above Big Pine, California at first light on February 26th. Light conversation, familiarity with the terrain (Ian had done the entire route the previous summer and I had done about half at various times), and a solid plan fed the fire and dampened the burn. Fitness, discipline, and a healthy balance of athleticism and experience worked in our favor. A solid weather forecast filled the sails. A simple itinerary broke the whole endeavor into roughly five palatable chunks. Team hubris encouraged a bivy site selection strategy closer to “winging it” than to “owning it”. While we set the watch to remind us to drink and eat every hour, we piloted the seat of our pants to excellent campsites four nights in a row. Night number one was by far the most memorable. 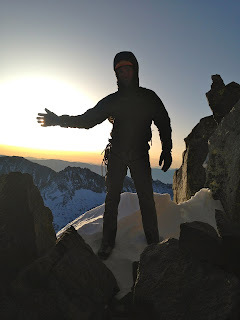 We perched ourselves, as close to “as planned” as could be, on the summit ridge of Middle Palisade, enjoying both sunset and sunrise from fourteen thousand feet. By the end of day two, at a sheltered camp on the north side of Mount Williams, the optimism of our first day in the open and night on the ground had yielded to the realities of Ian’s lower g.i. distress. Upon pitching a Scimitar Pass camp in the dark of night number three, still less than half-way through the route, we had only progressed as far as planning indicated would take us two days. Had we overestimated our booted and gloved climbing pace? Had Ian’s slow day number two cost us crucial progress? We huddled in the tent that night considering our options. We were two fifths of the way through the climb with three fifths of our resources consumed. We had the familiar guiding terrain of the “classic” Palisade Traverse (Sill to Thunderbolt) ahead. Pace would inevitably pick up there. We also had ahead the feared and cruxy descents of Mounts Jepson and Winchell. Rate would drop through those sections. Progress-slowing snow-cover would not decline ahead. If anything, these next, highest peaks above the main Palisade Glacier receive more snow than elsewhere in the immediate vicinity. Ian’s guts were getting better, but my tolerance for the continuous exposure was wearing thin. As any practitioner knows, mountains are more than geology and weather. They are more than challenge and opportunity and certainly more than a “proving ground”. Sincere motivation and profound experiences in the hills come from within the athlete. A climb, the cliche goes, is a microcosm of all of life. Furthering the abuse of cliche, the journey is the destination. 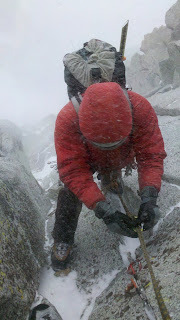 That being said, our experience up to and on the Palisade Traverse had no shortage of distracting elements. In June of 2012, another Pullharder team, this time consisting of Horne, Gil Weiss, and Brad Wilson, completed the seventh ascent of the Palisade Traverse. By then Ian and I knew we wanted to give the route a go in winter. With our own aspirations and regrettable, but real, competitive natures, the possible meaning of the team’s “warm up” (Horne’s words on Pullharder.org) climb did not go unnoticed. If a sense of competition and the accompanying internalized dehumanizing is burdensome on it’s own, imagine the entanglement of feelings when Horne and Weiss died in a climbing fall in Peru on July 13, 2012. The most significant prior attempt at a winter traverse of the Palisades was made in 2009 by a local/visitor partnership. The local player in that climb was a friend. He and I lived and climbed together for years. In 2010, this climber played a pivotal and deeply hurtful role in the demise of my marriage. For myself, the Palisades were (and are) more than geology and climate. They were more than challenge and opportunity and more than a proving ground. A winter traverse attempt was hard work, and an act of creative expression. While I would be in the peaks pushing myself regardless, the morass of motivation and emotions accompanying this particular endeavor cannot be discounted. That uncertain evening at Scimitar Pass, Ian and I sat under the weight of illness and fatigue. We sat together under the burden of logistics, conditions, hazards, and the unknown. We brought individual, but similar stories to the Palisades. To that point, we had lived parallel and separate lives through formative and profound relationship upheaval. My own relationship drama is woven from thread that traces a strand through this very chunk of topography. Ian and I both work in the same field, a field where one’s success can be driven by alpine notoriety. We both had our hearts broken with the retreat from the Evolution ridge. And fully crushed when we learned of the virtually immediate success of our hidden counterparts. Ian moves on. Ian lets it go, and just goes. Hard. I struggle a bit more. Until that third night up high, I could not have really told you where the motivation was coming from. And I couldn’t escape the guilt born of introspection and harsh reality. I went to the Palisades that week with many motives. Not the least, nor the most admirable, was competitiveness. And not just your ordinary sense of competition: Competition with the now-deceased. And competition with he whom, it can be said, had out-competed me once before. All this stewed around, mixed with your standard high-and-wild logistical concerns. Not to mention that we were tackling an endeavor for which there was no blue print. However, in a rare moment of inspiration, I found myself sharing a welcome and sincere internal motivation. “Even if we had no chance of actually finishing, I would be psyched to go on; just use up our fuel and enjoy the opportunity to work hard up here.” I’d be overly dramatic to say that the relief was instant and cathartic. However, the three hours of snow-melting that evening passed fairly quickly. That’s all one can ask of a long, dark night with short, spooned rest. Resolved to “enjoy the journey”, we proceeded free of pressure. Familiar terrain eliminated, at least briefly, the burden of uncertainty. Night four’s cold, wet, and horribly faceted snow ledge on Thunderbolt Peak gave us the drive to get out before number five. Winchell’s descent, elevated to mythical and impossible status by a year of dread, passed far more quickly and easily than anticipated. Ian returned to typical rock star form. We fueled the finish line slog to Agassiz on sunshine and inertia. The post-holing descent back to Glacier Lodge presented mainly supportable snow, with just a mile of thigh-deep sugary snow-swimming. The return to town and life and work was gentle, welcome, and comfortable. Our bodies slowly recovered. Some attention for our “accomplishment” brought unexpectedly bittersweet sentiment. It was super sweet to share our experience with the world. Earning the approval of peers is, predictably, a great feeling. However, much of it rang hollow. Indignantly, and ungratefully perhaps, Ian and I both found ourselves downplaying congratulations. “No, it’s not that sort of a big deal.” We are flush with satisfaction born of hard work in a challenging and uncertain environment. We are blessedly not drunk on the glory or inflated in the ego. Even the congratulatory phone call from the aforementioned adulterer did not carry quite the satisfaction one might envision. It is a deeply reassuring revelation to discover that it is indeed the challenge and resulting hard work and creativity that makes an endeavor like this worthy. We bivvied at Winchell pass, 3 men in 2 sleeping bags in a BD firstlight, storm forecast. Long story short, flying ice or something caused our tent to explode at about 10PM, we spent all night huddled trying to hold scraps of tent around us as our bags got soaked.